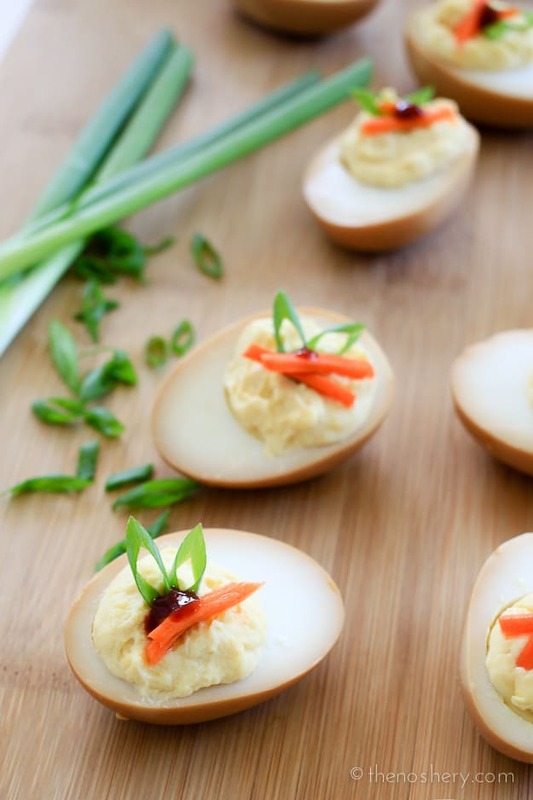 Whenever I go to a barbecue or potluck, I keep my eyes peeled for deviled eggs. I tend to be the greedy guest that loads my plate with deviled eggs. We love eggs of all forms in this household, and one of my favorites is deviled eggs. Funny thing is I never make them, so I am always on the lookout when attending any food gathering. About a year ago I discovered another amazing egg, the soy egg! It was at a little hole in the wall ramen house and floating in my bowl of ramen was the most amazing soy egg ever! I had discovered another egg to love. 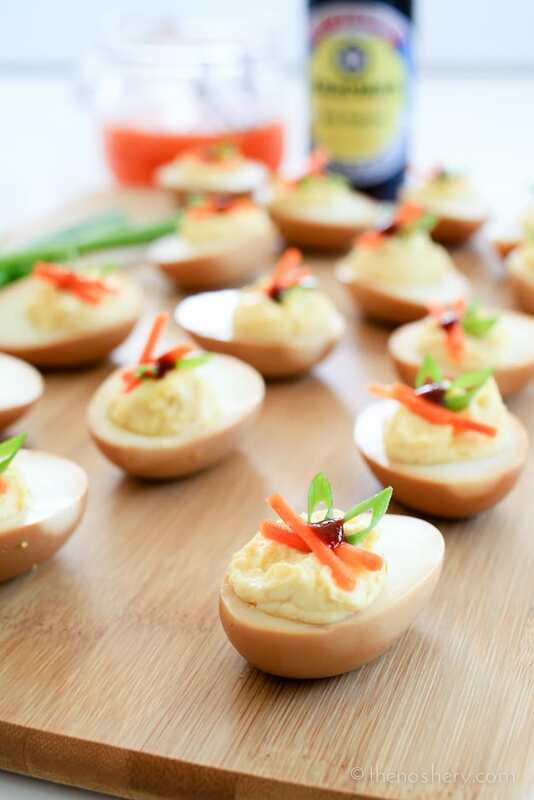 When Kikkoman asked me to create an appetizer featuring their fabulous soy sauce I got the idea to marry the amazing soy egg with the addictively delightful deviled egg. 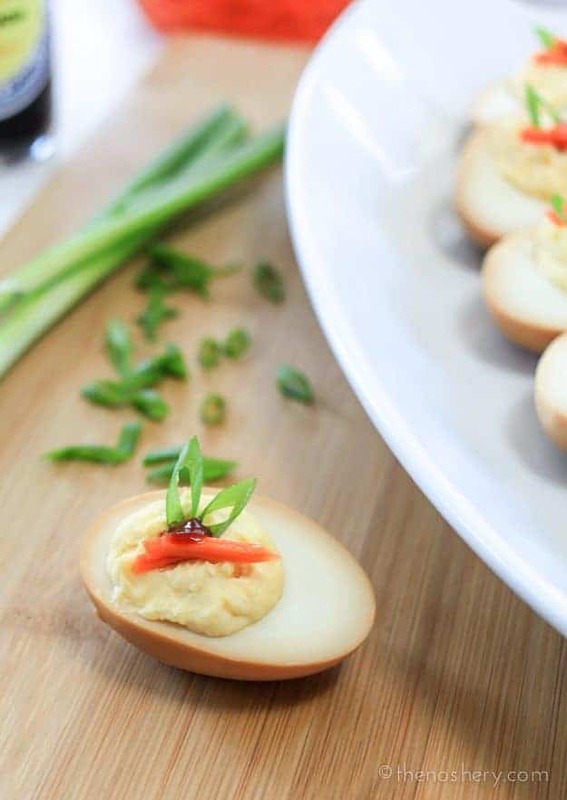 I have seen many versions of Asian inspired deviled eggs but, the focus is always on the filling. And, many time the filling looks dark or runny. I wanted to make an Asian inspired deviled egg that had all the flavor and still had a creamy filling. Using a soy egg technique seemed to be the perfect solution. Many think of soy sauce as a condiment to sprinkle over rice or noodles but, it can be so much more. 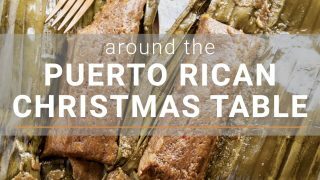 It’s a great and simple way to add saltiness and depth of flavor to any dish. It takes the time to develop that depth of flavor. Kikkoman Soy Sauce is aged for several months to develop that beautiful rich, yet mellow flavor. I warn you that these eggs are insanely addictive, you can’t have only one. 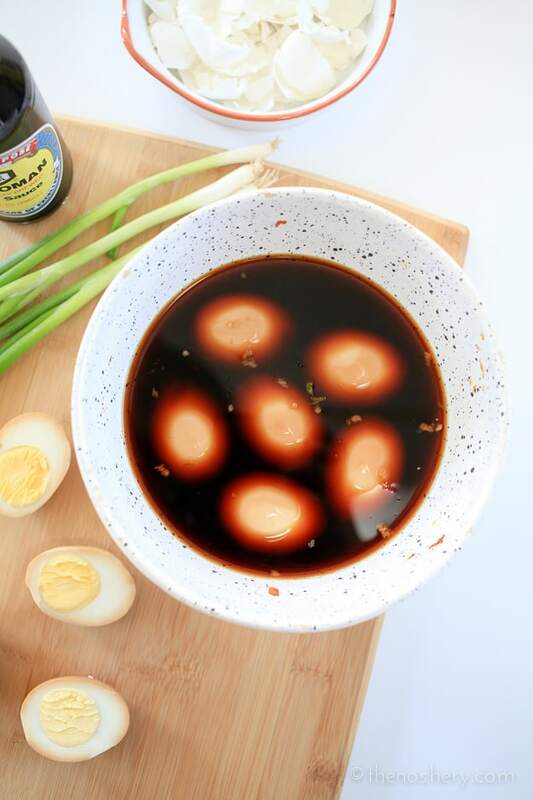 The eggs are marinated in a soy mixture for several hours, soaking in all of that deep rich flavor. 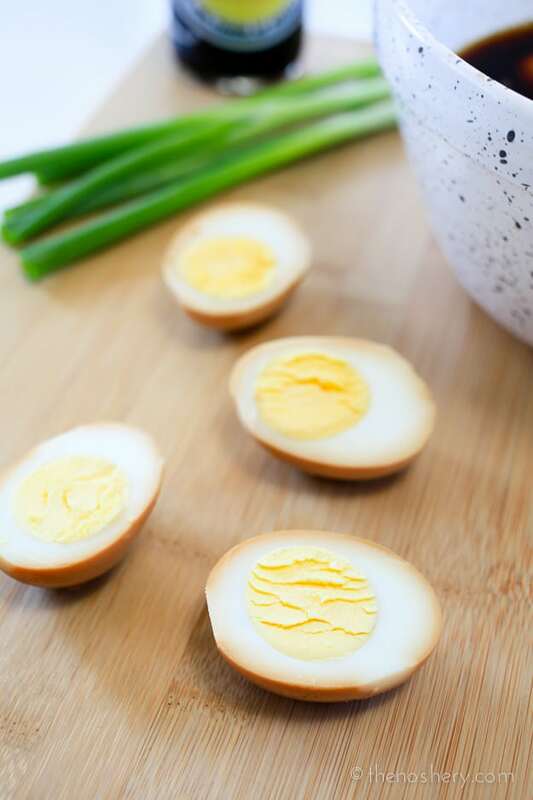 The yolks are blended and flavored with ginger and Chinese mustard giving the eggs a little bite. The next time you head out to a barbecue or potluck and plan to make a platter of deviled eggs I highly recommend giving these soy deviled eggs a try. They are elegant and a dance party for your tastebuds. But, I would recommend making a double batch because I promise they will go fast. Now go forth and take your deviled egg game up a notch. 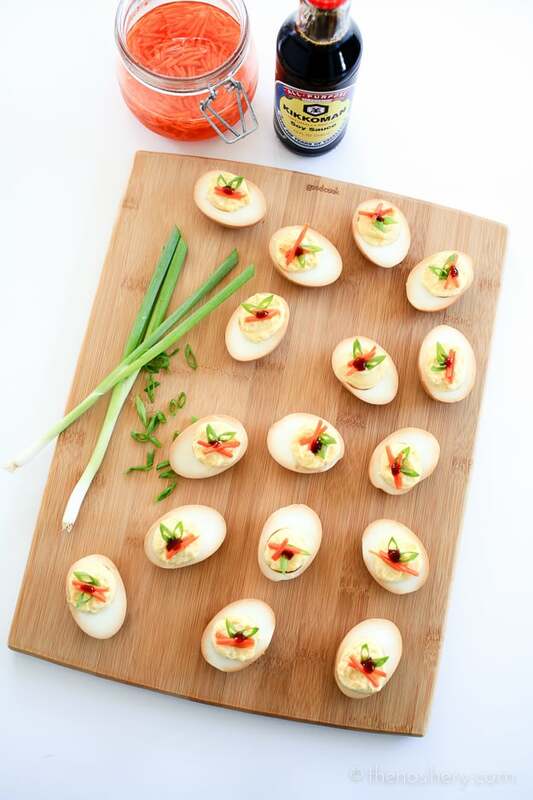 Make sure to visit Kikkoman for more recipe inspiration! In a small bowl combine marinade ingredients, stir until well combined, set aside. Place eggs in a single layer in a pot. Cover with at 1-2 inches of cold water. Place the eggs on the stove over high heat and bring to a boil. Once the pot comes to a boil cover and set the heat to low, continue cooking for 12-15 minutes. Transfer the eggs to an ice bath. 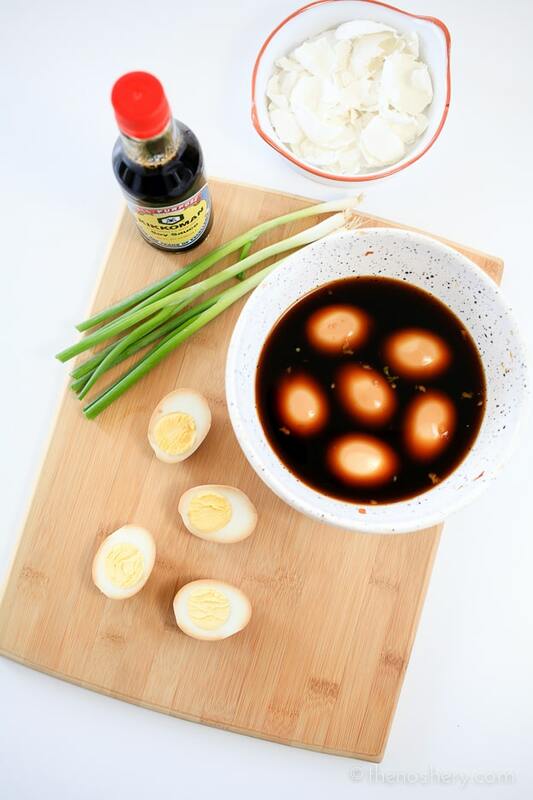 Once the eggs have cooled, peel and submerge completely in the marinade, if necessary, top the eggs with a small plate to weigh them down. Place in the refrigerator for 2 - 4 hours. Halve the eggs and remove the yolks into a small bowl. Add mayonnaise, ginger and mustard to the egg yolks. Using a fork mash and blend the yolks until smooth and creamy. Using a spatula transfer the filling to a resealable bag, cut a corner of the bag and pipe the filling into the egg halves. Hey there! Can these be made the day before an event? Piped and garnished day of? My girlfriend and I made these yesterday for thanksgiving. They’re great; we’ll definitely be making them again soon. We made a double recipe; I don’t think we needed to double the .75c of soy sauce to 1.5 just for anyone else’s reference. 1c probably would have been fine. Love this! It’s also gorg topped with the minced ginger, pickled shallot (in red wine and sugar), green onion and puffed brown rice for a bit of crunch! That’s what they do at Le Mary Celestre in Paris! i love deviled eggs but dont make it nearly enough. this sounds like a fantastic idea!